Bic Camera is an electronics retailer found only in Japan. The store is divided into two buildings: the first (Building 1) in Imaizumi, stocking phone accessories, computers and computing equipment, mobile phones, and a small Apple store. The top floor sells liquor and has a bicycle and golf store. 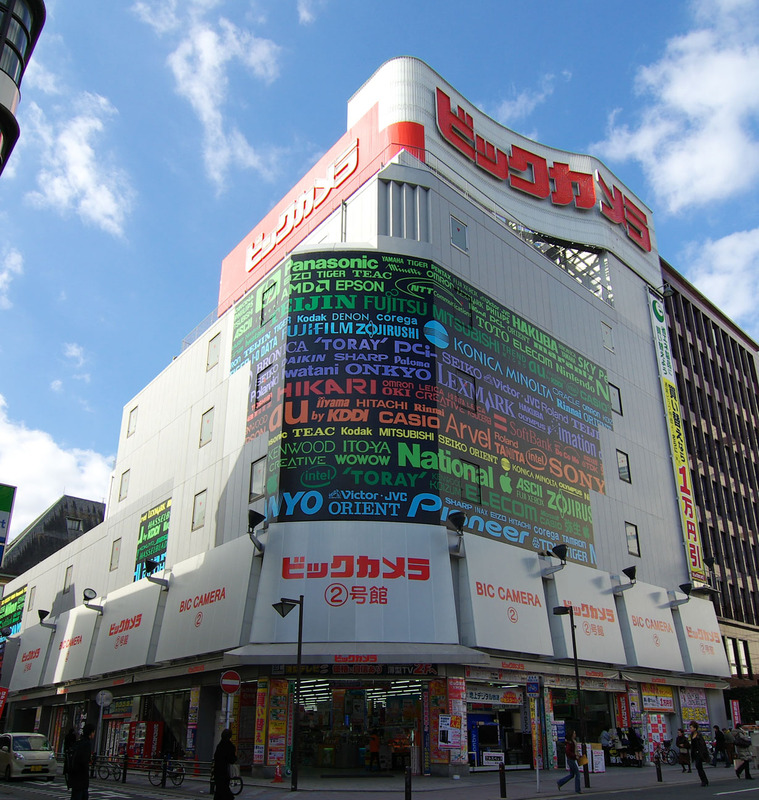 The second Bic Camera (Building 2) is in Tenjin, and it’s geared more towards domestic appliances (like washing machines, microwaves, vacuums, home security systems and A/C machines) but is larger than Building 1, with more products on offer. Bic is a great place to head if you’re in need of those essential appliances – perhaps for those who’ve moved recently or newly arrived in Japan. They have the little things too – like adapters, cameras, and electronic dictionaries for those who want to improve their Japanese! Perfect for you and for children, there’s a multitude of games and DVDs here, plus a little playground and toys to play with. You might be surprised but alcohol is on sale at Bic Camera too! There’s a very good selection at reasonable prices. The staggering range of phone covers available here are very popular amongst foreigners! You’re bound to find a style that suits you, whether it’s classical, colourful, cute or a novelty phone case, or another keitai accessory. A range of golfing supplies are on sale here – clubs, caddies, balls, and gloves. There’s also a very convenient mini golf training course to test out your new clubs. Here you can buy sunglasses and prescription glasses. Wristwatch and glasses repairs are also available. If you love electronics, then Bic Camera is the place to go to check out the newest products, whether its the unique Japanese toilets or the latest TV set. If you’re not keen for purchasing anything new, you can still try out the tablets and cameras. For Children: For children, we recommend going directly to Bic Camera 2 in Tenjin on the sixth floor, where there’s a small playground and many, many toys! For Men: Bic Camera is mostly gender neutral, but men can pick up shavers and other grooming products on the first floor of the second building. For Women: There’s a beauty corner on the first floor of the second building, stocking hair curlers and straighteners, foot spas, cosmetics, hair products and dyes, and much more. For Tourists: The camera corner on the third floor is perfect for tourists who want to pick up a high-quality, low-price camera in order to capture their trip to Fukuoka. On the same floor you can buy luggage and travel bags, just in case you are heading home with much more than you came with!